See parent article on prepping priorities. 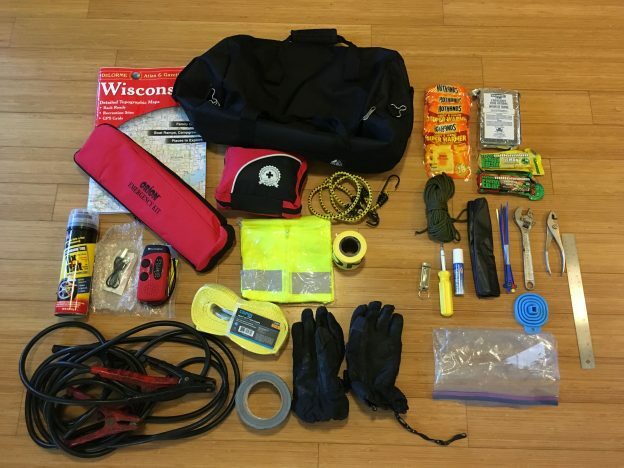 The Emergency Car Kit consists of everything in the picture above (stored in a duffle bag in the trunk) and some items stored inside the car (pictured below). You could, of course, just buy a kit from AAA, but as with anything, you get what you pay for. I’m not knocking the AAA and other off-the-shelf kits, I don’t own them. Please comment if you do. 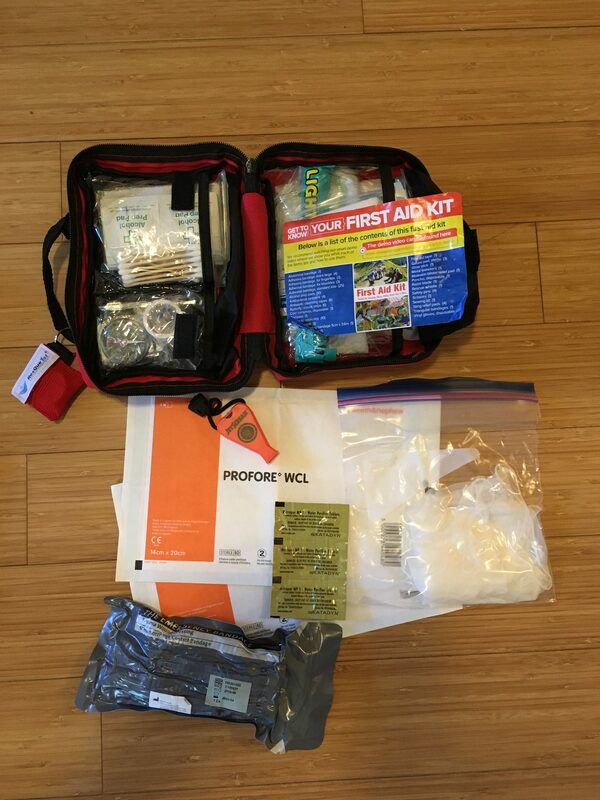 Ideally, the Emergency Car Kit would form an integrated supplement to your 72-hour disaster kit (all the car-related items in one kit, all the human survival related items in another), itself a portable solution for many of the 9 priorities covered in the parent article. 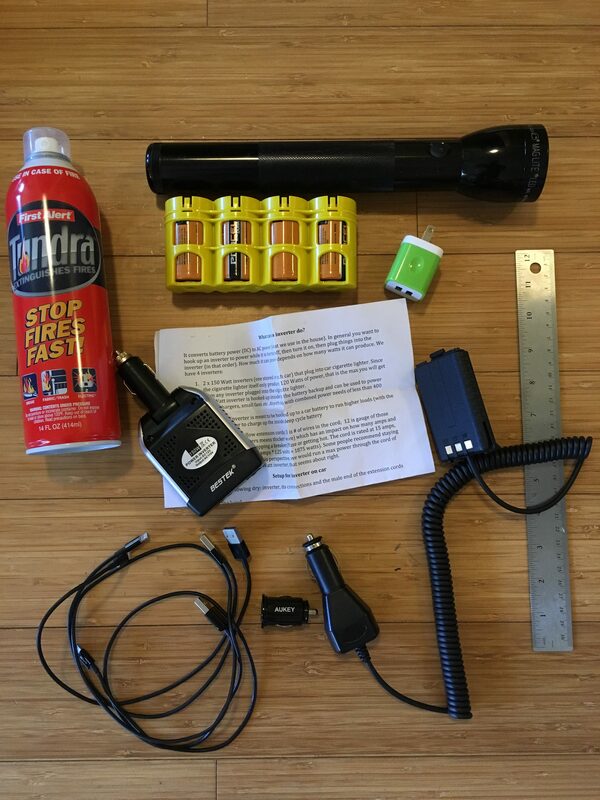 Fix-A-Flat Aerosol Tire Inflator ($10). I’m not sure if this works reliably in cold temperatures. Orion emergency road flares ($23 with shipping). If you get this, you do not need an additional reflective vest as the kit comes with one. First aid kit ($20). I have supplemented this particular first aid kit with the items pictured below the kit. They include water purification tablets, rubber gloves, a better emergency whistle ($6.50), an Israeli style bandage ($9), and sterile bandages designed to be put directly on wounds. Hooked to the carry strap is a better CPR mask ($2-3 each but came in a 5-pack for $12). Tow strap ($10). I’d rather have one of these that has a ratchet and doubles as a strap for securing items to the roof, but at the time, I didn’t think of this. Emergency food. These taste kind of like pasty sugar, but are designed for 5 years shelf-life and the calories you need in an emergency. 2 x New Millennium Energy Bars ($1.50 each, 12-pack for $18) each with 4,000 calories. They come in flavors. None of them are something you’d really want to eat in a non-emergency, but that’s not what they’re for. Also in the trunk is a sleeping bag. I used to have water back there in the collapsable water bags featured in this article but had problems with condensation making everything wet. Another item that would probably be good is one or more gasoline cans. There is a collapsable version of these available, designed for one-time use only. In addition to the items that live in the duffle bag in the back of the trunk, the items pictured above are stored inside the car. Other than the fire extinguisher, all of these items are part of the emergency power and emergency communications plans. Tundra fire extinguisher ($11, comes in two-pack for $22). Hint: Draw an arrow on the top of the white dispenser with a black sharpie to indicate the outlet — in an emergency, you don’t want to fire the wrong direction. A 150-watt cigarette lighter inverter ($18). Note: cigarette lighters typically produce 120 Watts of power so your 150-Watt inverter will obviously only throughput 120 Watts. See emergency communications article for more details and how this and the car is part of a larger emergency power plan. 2 x 1 foot USB-iphone charging cables ($4). 5-pack is $10 so cost is about $2 each. Baofeng Radio cigarette lighter charger ($15). See emergency communications article for more details. This post has been read 361 times. This entry was posted in Prepping and tagged emergency automobile kit, emergency car kit on October 8, 2017 by dmac.